As much as I am in denial about the fact that there are only a few weeks left of summer, I know that summer will inevitably say goodbye as sure as The Great Movie Ride already has (We’ll always have Paris!). Fortunately, I can’t be too down in the dumps because there are some things to look forward to – the return of must-see TV, cool fall weather, and the start of Epcot Food & Wine Festival. This annual showcase of food, drinks, and merriment may very well be my most favorite event in all of Disney. This year, the Festival promises to be bigger than ever: not only is the Festival running for a record 75 days – from August 31 to November 13 – but there is also a record number of Global Marketplaces (35!) featuring amazing dishes from across the world. If I were to have a network playing on the background on the TV, it’s most likely The Food Network (which will change to Disney once my children get a hold of the remote control, but I digress). The Epcot Food & Wine Festival is showcasing some amazing culinary talent this year – and you can see them live in action! Here’s a small sampling of a very long lineup of culinary greats: Art Smith, Bryan Voltaggio, Buddy Valastro, Carla Hall, Cat Cora, Geoffrey Zakarian, Garham Elliott, Jehangir Mehta, Maneet Chauhan, and Robert Irvine. And of course, we’ll also see famous chefs within the Walt Disney World resorts, including Scott Hunnel of the legendary Victoria & Albert’s. It might be considered a splurge, but Party for the Senses promises to be a great evening of food, drinks and entertainment. 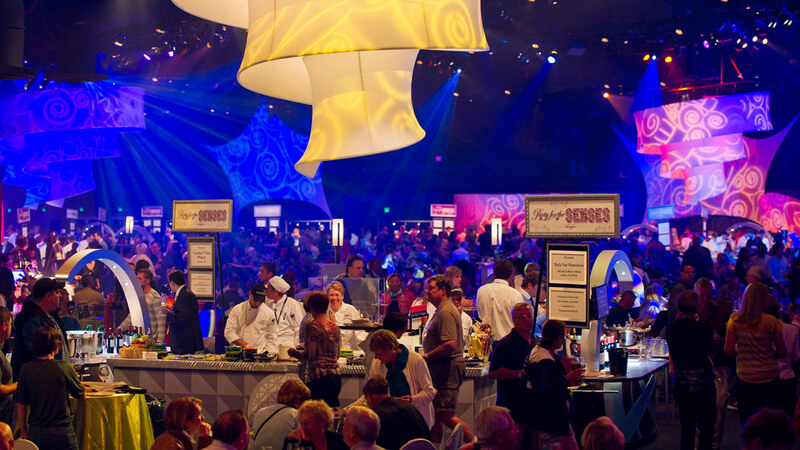 Held at the World ShowPlace Events Pavilion, this event runs on select Saturdays from 7:30 pm to 10:00 pm during the Epcot Food & Wine Festival. World-renowned chefs and master sommeliers get together to create a feast for all guests. Picture different tasting stations with various food items & drinks scattered all throughout the event – yours to enjoy over and over! And if you’re ready to take a break, have a seat and enjoy the performances – in previous years, we have seen Cirque du Soleil acrobats, singers, and musicians. As a bonus, this event also gives you reserved seating for either the 5:30 pm or 6:45 pm Eat to the Beat Concert Series (more on that later). The event dates for this year’s Festival are: 9/23, 10/7, 10/14, 10/21, and 11/11. On 9/23, Party for the Senses will feature chefs from Disney Springs, and on 10/21, the party will feature chefs throughout the Disney Parks. Live from Epcot, the cast of The CHEW – including Mario Batali, Carla Hall, Clinton Kelly and Michael Symon (we will miss you, Daphne Oz!) – will showcase their charm and wit while talking about their favorite dishes and cooking tips. The show will be live from Wednesday through Friday, 10/4-10/6, from 9:00 am to 12:00 pm (airing 10/9-10/13). Valid audience ticket is required, and valid Epcot admission is required. To request tickets to see the show, click here. 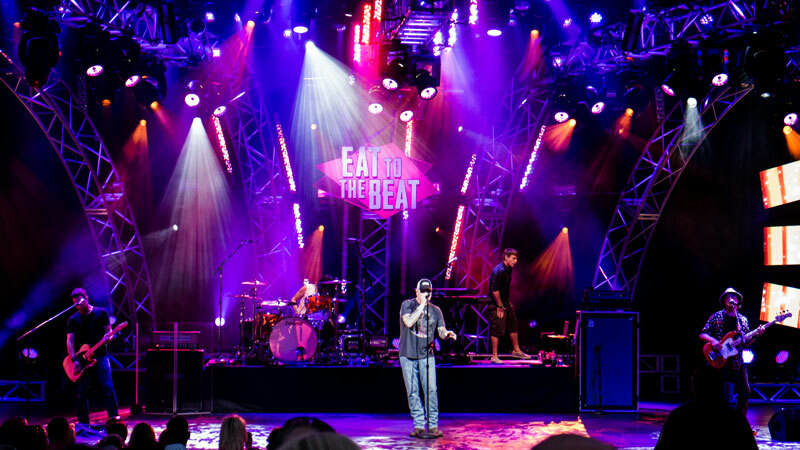 The Eat to the Beat Concert Series, in my mind, is as seminal to the Epcot Food & Wine Festival as the Global Marketplaces. Each night of the Festival, Disney will showcase top notch performers across different genres at the World Showcase at Epcot America Gardens Theatre. Showtimes are at 5:30 pm, 6:45 pm, and 8:00 pm. Click here for a listing of all the performers this year. Please note: if you are using your Disney Dining Plan table service entitlement, you will need to use 2 table service credits per person for the Eat to the Beat Dining Package. Reason Number 1: The Eats! 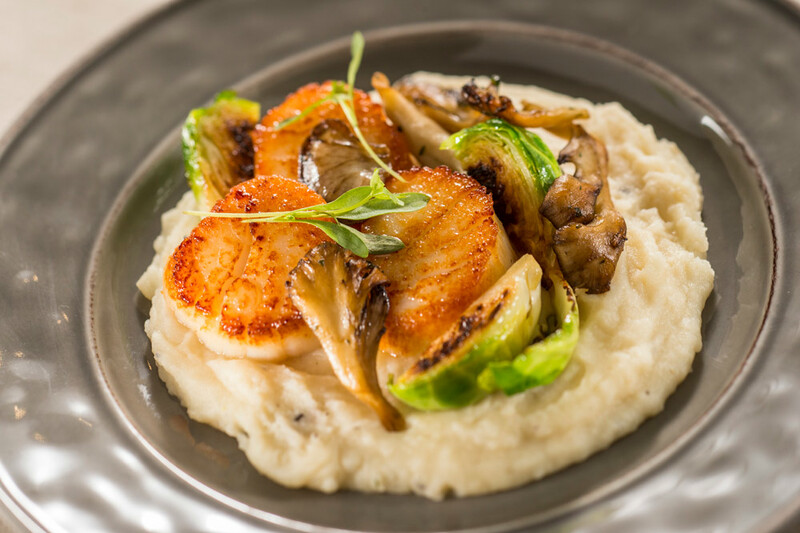 Coastal Eats features fresh seafood, like Lump Crab Cake with Napa Cabbage Slaw and Avocado Lemongrass Cream, Baked Shrimp Scampi Dip with Sourdough Baguette, and Seared Scallops with Roasted Corn and Butterbean Succotash and Chili-Chipotle Butter Sauce. To view the full, drool-worthy menu at all the Global Marketplaces, click here. And with that, let me turn it over to you: what are you looking forward to the most at this year’s Epcot Food & Wine Festival? Which new Global Marketplace will you try first? Which Eat to the Beat Concert Series performer will you line up for? Sound off in the comments below! Fall is a great time to visit Walt Disney World. With events like the Epcot Food & Wine Festival and Mickey’s Not-So-Scary Halloween Party, there is just so much to see and do. If you are thinking about planning a vacation to Disney, contact me at myra@worldofmagictravel.com or (920) 526-0809. As the resident travel agent for Guide2WDW, it is my job to make sure you get a great deal when you travel and also give you the latest tips and tricks to make the most out of your vacation! Contact me for a FREE quote today! ← Disney PhotoPass Day is coming August 19 – Here are all the special photo ops. Myra is a Disney travel specialist with World of Magic Travel and is the resident travel agent at Guide2WDW. She lives in New Jersey with her husband and two little princesses, ages 8 and 5. Her family’s answer for their Disney fix is most frequently Walt Disney World, but they have also been to Disneyland in California and Hong Kong and aboard the Disney Dream & Fantasy. In between Disney trips, Myra and her family love to travel to nearby cities and try to do what the locals do. If you have questions about Disney or travel in general, Myra is always happy to share her geeky love of Disney and vacation planning. You can see more of her travel posts and tips on her Facebook page or you can send her an email directly at myra@worldofmagictravel.com.